Making Or Buying A Cake? Discussion in Food & Drink started by kamai • Jan 13, 2017. My friend and I will be baking a cake for one of our other friends baby shower. We figured it would be cheaper and more personalized making it ourselves. We find that cakes now a days can get a bit too pricey so we opted to make it, besides my friend is a great artist and will be able to make a very cute design for it. I think our friend will appreciate our home made cake even more since we are going to make it just how she wants it. Do you buy or make your own cakes? If so, do you find it cheaper? I personally make all my cakes, because I enjoy it and it is cheaper. 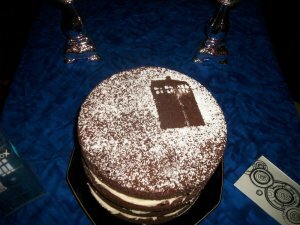 Here is a couple of my cakes one is super simple tardis cake and the other was a wedding cake. I have made more but I lost the photos , I like simple cakes that look nice! I will add though depending on the size of the cake it can get pricey! It may be cheaper to bake a cake but it's A LOT more time consuming so I prefer just purchasing one. If you purchase cakes at major stores, they tend to cost a lot so I suggest visiting a bakery and asking for their prices since you pay for their work and design. You can always purchase a plain one that tastes good if you only want the taste so you won't have to pay the design price. The fact is I cannot make cake, so I would take to buying cake if I have a celebration to do. If I were good at cake making then I would gladly like to bake cake for my occasions myself or at least play a supervisory role at the preparations. That way I will ensure the kind of quality ingredients and the right proportions I want are kept to. My daughters are good cake makers. The problem is we don't have a baking oven. So to do it, we just buy the baked cake without icing, design and anything. Then my daughter designs it. At least we save a little money if we have to buy a ready-made cake. Now she's working abroad. Her 3-year old daughter recently celebrated her birthday. Her hubby was obliged to order the cake for their daughter. The cake's motif is Sofia the First. I have never baked a cake because I never had an oven. Rather I am not keen on buying an oven because I am not into baking. Either way, if I want to eat a cake I find it easier to buy then go through all the laborious process of baking one at home. I feel it may be a little cheaper to bake at home but knowing that fancy looking cakes needs a lot of extra costly items I rather stick to buying one from outside. I have no experience of making cake, but last week we decided to make a cake at home as kids were supposed to take it to school. I checked a YouTube video which made us fully confident. I bought all items required for it. But it could not come out as expected, it was a total failure. Moreover, when I calculated the amount I spent on the ingredients buying a cake from bakery seem to be cheap. But I am yet to give up and will try to make another one next week or so. This time I got some experience and I am confident that I can make it this time. I buy my cakes always. I'm not a good home baker. Just add water then bake is my style of baking at home. 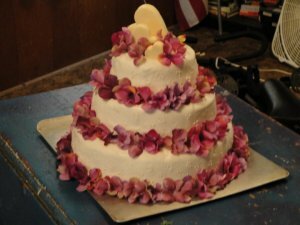 I buy all sorts of no sugar added pastries, but have not found any sugar free cakes locally on Oahu. I buy those sugar free loafs and it's not as good as the sugar ones, yet. I'm so disappointed that we don't have enough selection for sugar free cakes locally. It is definitely cheaper when you cook it yourself instead of buying. I used to bake cassava cake as gifts for occasions that I am invited to. And the appreciation of the food is greater when they learn that it was me who baked it. However, I am not that energetic anymore to buy ingredients and prepare for baking. It is a big work and I prefer to relax than stress myself with such work. Sorry but this is an issue with my age. For young people, do the baking until you can. It's not only the money saved but the satisfaction of baking. I do always bake cakes at home. Initially it was not easier to bring out a nicely baked cake, but over a period of time I learned the art of making one. Apart form being cost effective, home made cakes are not as harmful for health as the outside one. There're not many ingredients needed. I buy the portions according to certain measure so that it could be used to make couple of cakes at a time. Wow! You are a true artist they look beautiful and delicious. I am not very good at making them look nice though but my friend is, I pretty much try to do my best with the baking. I am sorry you lost the other pictures I would have loved to see them. You are right home made cakes can be healthier as we can chose our own ingredients and portions. Yes it was tough making our first cake but as yourself we eventually got the hang of it. I told my friend since she is so good at making beautiful cakes she should start a cake shop. Given the fact that cake is just not one of my favorites, I would have to go with whichever one is the cheapest. Something tells me that making your own is cheaper, but then again I am sure you can find some good deals and not have to have all that extra ingredients on hand. I have done both. When I can afford it I usually choose to buy a cake because I love the design options you can get with store boughten cakes, and they tend to taste better. I have no decorating tips or anything to make a cake look extra special. The cheapest way of course is to make a cake from scratch, but I don't do enough scratch baking to make a cake that tastes really good. I make my own cakes because most commercial cakes these days are dry and not moist. They also use chemicals used for poisoning rats to keep their bake goods soft. I find baking my own much more cheaper because I already bought bulk inventories of baking supplies. That's a fact I agree with that home baked cakes are not as harmful as the bought ones. This beats my imagination why would people use ingredients in food which have been certified not healthy in the human body. For example, the use Potassium Bromate in bread is understood dangerous to health. Sometimes I think about giving in few weeks or months to learn catering and start making any food I need myself. A mix. I tend to make my own, but it takes time, and with work and home I don't always have it. That's when I resort to cake mixes or store-bought cakes. I tend not to buy the ones from the supermarket though because they always give me a headache. I think its the preservatives. There's a local farm baker who does sponge cakes to order cheaply (they just mix extra sponge mix), so I get them from there. @TheKnight agreed, my wife knows how to bake cake and makes awesome ones. But we prefer buying cakes since it really is a time consuming task. She bakes once a week but we usually buy in stores. I have done both in the past, even though I like making cakes. Lately ready-made and decorated cakes have gotten really expensive. I usually just make one now. I've tried several very affordable recipes. I don't always like the texture though. I recently came across a recipe for making a box cake taste more like the ones you get at the bakery. You can buy a boxed cake mix, any flavor you like, and change the ingredients a bit. Instead of water, add milk. Instead of the recommended oil, use melted butter. Add an extra egg or two. Add a teaspoon of vanilla. Use real, pure, vanilla. You may have to bake it a few minutes longer than what the package says, but it comes out much nicer. Bakery taste, without the bakery prices. Then just shop around for cute decorations or make some yourself. Homemade icing is great too. Find butter on sale and make homemade butter cream. Yum.